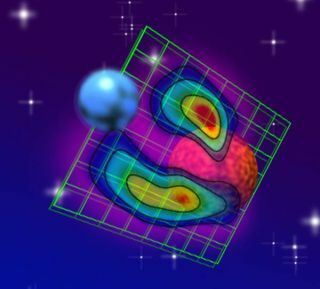 Artist's conception of the Algol binary star system with radio image superimposed on the grid. Astronomers have detected a giant magnetic loop sweeping outfrom a pair of binary stars in the Milky Way. "This is the first time we've seen a feature like thisin the magnetic field of any star other than thesun," said William Peterson of the University of Iowa. The stellar pair, called Algol, includes a star about three times more massivethan the sun along with a less-massive companion. The two lie about 93light-years away from Earth. They have been known since ancient times as "The Demon Star"because they appear as one object that blinks on and off ? a phenomenon caused whenone star passes in front of the other. Within the binary, the smaller star orbits the larger at a distanceof 5.8 million miles, only about 6 percent of the distance between Earth andthe sun. The newly discovered magnetic loop emerges from the poles ofthe mini star and stretches outward in the direction of the primary star. Asthe little star orbits, one side ? the side with the magnetic loop ? constantlyfaces its companion, just as the same side of our moon always faces the Earth. The researchers discovered the magnetic loop by makingextremely detailed images of the system using a network of large radio telescopescalled the High Sensitivity Array. This collection includes the NationalScience Foundation's Very Long Baseline Array (which includes radio dishesacross the United States), the Very Large Array in New Mexico, the Robert C.Byrd Green Bank Telescope in West Virginia, and the Effelsberg radio telescopein Germany. When used as a single observing system, the network offers veryhigh resolution and sensitivity to detect distant radio waves. Algol, in the constellation Perseus, is visible to the nakedeye and well-known to amateur astronomers. As seen from Earth, the two stars regularlypass in front of each other, causing a notable change in brightness. The paircompletes a cycle of such eclipses in less than three days. The variability inbrightness was discovered by an Italian astronomer in 1667, and was finallyunderstood as an eclipsingbinary in 1889.
may be similar magnetic features in other double-star systems. Peterson and team reported their findings in the Jan. 14 issue of the journalNature.